Ensuring that its food meets the demands of its retailers and the consumers who eat it is essential to the success of any produce business. This builds consumer trust and helps retailers confidently supply the food we all eat. To help out on this front, the USDA’s Agricultural Marketing Service (AMS) offers audits through the USDA Good Agricultural Practices (GAPs) & Good Handling Practices (GHPs) Audit Verification Program. A voluntary service provided by the USDA’s Agricultural Marketing Service (AMS), GAPs audits verify that fruits and vegetables are grown, packed, handled, and stored safely. The audits certify that operations are following guidance from the Food and Drug Administration and industry-recognized food safety practices that can minimize the risks of food-borne illnesses. 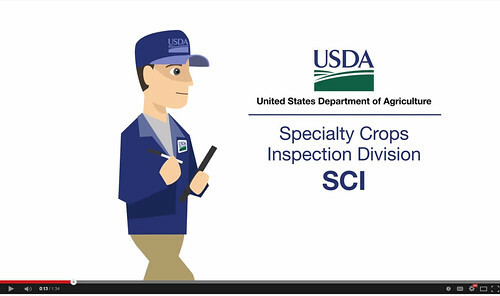 AMS Specialty Crops Inspection (SCI) Division employees accomplish this through activities like evaluating food safety plans, walking the farm looking for food safety risks and performing unannounced visits to farms and facilities. The audits focus on waste management, such as animal manure; water quality; wildlife; and worker health and hygiene. To date, AMS has performed 14,000 audits of farms, packinghouses, and wholesale distribution centers. Committed to increasing this number, AMS will be sharing information about the GAPs Audit Program in our January 22nd webinar, Good Agricultural Practices (GAP) 102 – Audit Preparation. If you grow, pack, ship or buy and sell fruits and vegetables, we recommend that you register for the webinar. This webinar is geared to help small and mid-sized farmers in StrikeForce areas – rural counties that are suffering from consistent poverty. As more and more buyers, traders, and retailers are requiring their suppliers to have a GAP certificate, getting certified is a great way for these farmers to reach larger markets. For example, a group of small farmers in Tuskegee, Alabama, used GAP certification to expand their operation from selling on the spot market at places like roadside stands and farmers markets. With the help of a GAP certificate, they were able to land a contract with a big box retailer, providing them more stability through a guaranteed market with consistent prices. To help other small farmers realize this type of success, AMS has partnered with the Wallace Center at Winrock International to create a Group GAP Pilot Program. The pilot allows cooperatives, food hubs, and other marketing organizations to offset the costs of GAP certification by pooling their resources together. Hoping to expand the program, AMS regularly communicates with pilot participants through outreach events and trainings. As a result, three out of the pilot’s eight groups already received GAP certification while another is expected to be certified early in the 2015 growing season. Audits are just one of the many services that we can provide. After you register for the webinar, we also recommend that you view Introducing the USDA Specialty Crops Inspection Division to see what other ways AMS can support your business. Whether they are small or large, in rural America or in the city, AMS is committed to creating opportunities for our nation’s produce businesses.